Cocoweb's classically-designed Oldage wall sconces add timeless flair to any space while providing energy-efficient illumination! Designed in the form of a classic barn light, the 12" Oldage lamp shade in Matte Black refines the look of any space it occupies. Paired with the graceful, curved shape of the Matte Black Trim arm, it makes for a wall sconce that suits any decor style. Our wall sconces are decorative light fixtures that illuminate without taking any floor space, making them a perfect addition to small areas like hallways and bathroom vanities. They also function well as task lighting or accent lighting fixtures. Place a wall sconce in your bedroom beside your headboard as a reading light or add one to a living room or lounge for ambient light and warmth. Truly designed with versatility in mind, the Oldage Sconce with the Trim Arm may be used to light your kitchen, bathroom, or any indoor space or to welcome guests by being placed outside by your front door. Find just the right wall sconce to suit your home or commercial space by choosing from the wide selection of sizes, colors, shade styles, and arm styles we have available. The Oldage shade ranges in size from 12” to 14” and its color options include Black, Cherry Red, Galvanized Silver, Vintage Green, Mahogany Bronze, Matte Black, Solid Copper, and Cobalt Blue. This light shade is well-suited for any of our 3 sconce arms. The curved design of the Trim arm creates a slightly ornamental look, as does the Chic arm. For a sconce that keeps more focus on the design of the shade, try the Cosmopolitan arm with its straight bar form. 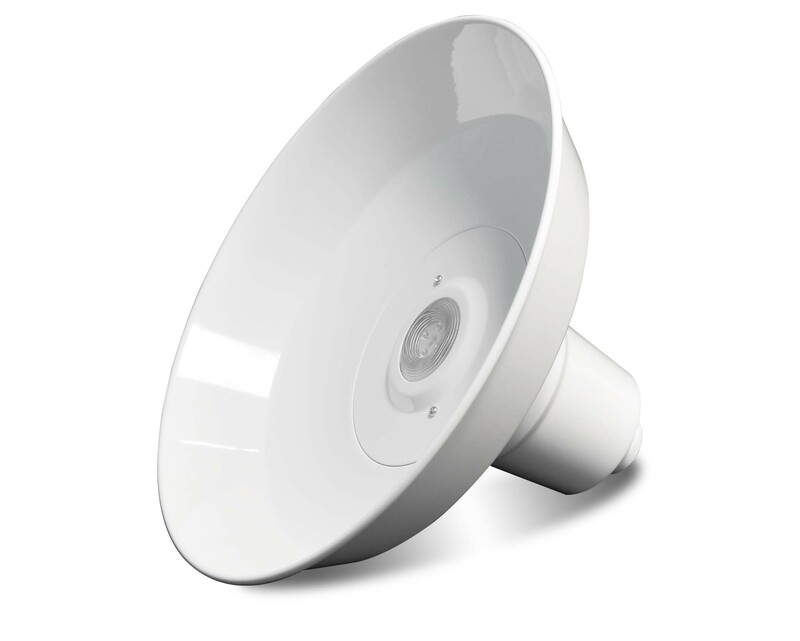 Integrated with the latest lighting technology, Cocoweb Sconce Lights use LED nodes to produce light at a warm 2700K color temperature and a full 1600 lumens of brightness. The result is an illumination that feels like natural sunlight and retains a brightness equivalent to a 100W bulb. Where most traditional light bulbs last for a year or two at most, our LED bulbs last for 50,000 hours, providing vibrant lighting for nearly 20 years with average use. Built to maximize energy efficiency, our LED sconce lights use a mere 24 watts of electricity and still last for over 50,000 hours when operating at full brightness. This efficiency not only saves you hundreds on your electric bill, but also reduces pollution in the environment. 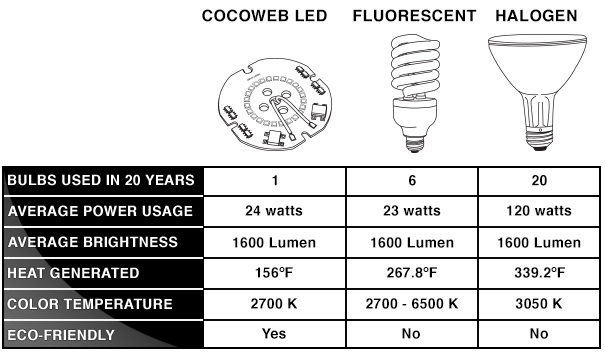 Every Cocoweb Sconce Light is compatible with most wall dimmers, allowing for a full range of brightness up to 1600 lumens. 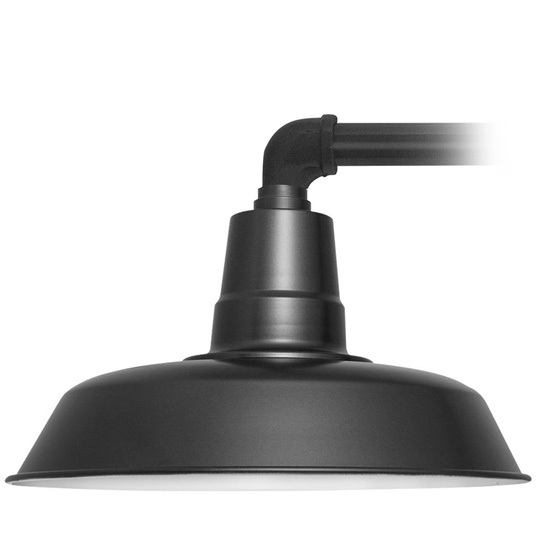 In order to ensure quality lighting no matter the weather, our wall sconces are finished with a water-resistant powder coat on a steel frame. This weatherproofing allows it to function, rain or shine. In fact, all of our Sconce Lights meet MET standards for use in wet locations. We take pride in making sure that our customers are satisfied with every purchase, and back our lighting products with a 2-year Manufacturer’s Warranty.